Bible colleges are many and mixed, over 1000 strong and counting. With Christian colleges and universities added in, the number of schools for studying the Bible expands still further. Steering through such a huge field stof schools to find the right one for studying the Bible can be formidable. 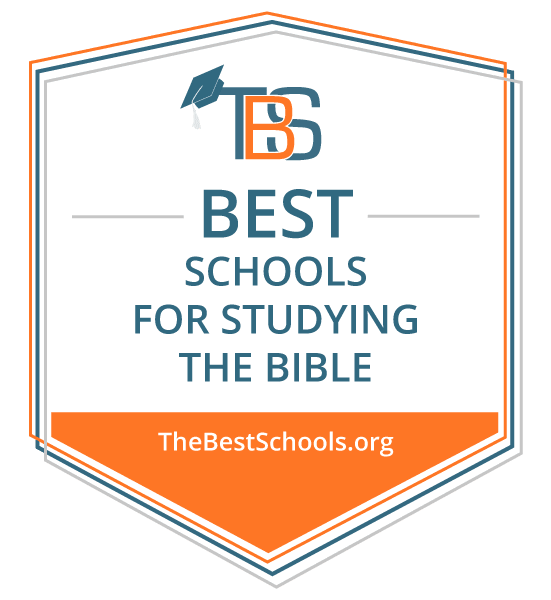 Below are 25 outstanding schools (and some honorable mentions) that deserve consideration for prospective students interested in studying the Bible. The following schools earned a place on this list through individual holistic considerations (it's not an impersonal robo-list). Criteria include their (1) commitment to sound Christian education, (2) academic excellence, (3) the spiritual-life on campus, (4) and their impressive Bible curriculum. Also, (5) all entrants are expected to have accreditation with some combination of the following boards: Association for Biblical Higher Education (ABHE), Transnational Association of Christian Colleges and Schools (TRACS), Association of Theological Schools (ATS), and Council for Christian Colleges and Universities (CCCU). Biola University ranks #1 on The 25 Best Schools for Studying the Bible! Anchoring conservative Christian academia on the west coast, Los Angeles-based Biola is an established top-tier Christian school. Biola has made several "Best School" lists as a standout for Christian worldview and apologetics training. It has several noted faculty who travel the world and teach biblical worldview and Christian apologetics, including William Lane Craig, J.P. Moreland, Greg Koukl, Craig Hazen, Jay Warner Wallace, and Doug Geivett. Collegiates in the Torrey Honors Institute feast on a Great Books Curriculum, while graduate students enjoy, among other degree options, a Master of Arts in Philosophy, or in Apologetics, or in the combined field of Religion and Science. Biola offers no fewer than 36 courses in its Bible department alone. Honors students pursuing a biblical studies major have a total course load of 147 hours, including 12 hours each in Biblical Greek and Hebrew (six hours more than a typical Master of Divinity Degree!). Factor in Biola's apologetics prowess, and students are assured an impressive biblical education. Biola's emphasis on the Bible and a Biblical worldview, however, is not restricted to their Bible department. The university is one of the world's best at framing all of its departments within a biblical-Christian worldview. For example, across their science fields, Biola emphasizes Intelligent Design and Christian philosophy of science. Literature students should expect study opportunities in great works of Christian literature, as well as apologetic critiques of non-Christian literature. Art and film students can expect Christian values and virtues at work within the department's shows and displays. As for Christian missions, Biola offers an array of extra-curricular apologetics and mission activities, including the largest annual missions conference in the world. Moreover, the adjoining Talbot Theological Seminary carries on that apologetics prowess with ministry degrees for the church-minded Bible student (MDiv, MA, and DMin). Biola is one of the more expensive schools on this list, $48,686, and is one of the largest schools on the list at over 6,000 students. It might be too large or too expensive for some students. Also, the Los Angeles locale, and its traffic, may be a bit intimidating for students looking for a low-profile or small-town atmosphere. But these concerns are balanced by the school's high standards across the board, which make it an outstanding choice for anyone seeking a superb, authentically Christian education. Moody Bible Institute ranks #2 on The 25 Best Schools for Studying the Bible! Chicago-based Moody Bible Institute is perhaps the clearest example of a pure Bible school at the undergraduate level. Think "seminary" for undergraduates. Moody locates itself within the long, but thinning, tradition of university-level education focused on ministry preparation. Few schools have a history or recognition comparable to Moody's, while maintaining roots within the soil of conservative, evangelical ministry training. Originally started in the late 19th century by revivalist Dwight L. Moody, this Society for Bible Study has since blossomed into one of the most widely recognized Christian schools in the world. Eschewing the terms "college" and "university," Moody dons the title of "Institute" strategically, avoiding the misnomer of "liberal arts college," since it is not focused on broad-based humanities education. Nor is it a "university" in the sense of offering more than half of its degrees outside of the humanities. Moody is a well-accredited (for a ministry school) collegiate institute unique for its simple and direct focus. For example, entering students must sign a letter of "intent to enter the ministry." Besides focusing the school's aim on the ministry, this prerequisite also shapes the campus culture around Christian service, preaching, and teaching. Students can also study apologetics and philosophy within the theology department, to bolster their Bible- and mission-intensive course load. Moody sports an enrollment of over 4,000 students, with more than two dozen degree-granting programs, as well as three online degrees. The cost is very low---tuition is free, while room & board, books, fees, and other incidentals may amount to around $14,600 per school year. Attending students can expect unapologetically biblical, conservative training, ranging from abstract theology to practical vocational training in ministry. Church-ministry minded students will not be disappointed. Moody Bible Institute ranks #15 on The Best Colleges for Homeschool Graduates. Liberty University ranks #3 on The 25 Best Schools for Studying the Bible! Planted in the middle of Virginia, is Lynchburg-based Southern Baptist powerhouse, Liberty University. This school is very denominational, but with Southern Baptists being the largest evangelical denomination in the United States, that will suit many collegiates just fine. Liberty is the largest school on the list, and also the youngest. Founded in 1971, Liberty has over 15,000 resident students and over 90,000 online. The school's protestant, evangelical, and Baptist lineage plant it deep within the soil of "Scripture-Alone" doctrine (AKA: sola scriptura). For this reason, Catholics might find the school uncomfortable and narrow in its emphasis on the sole authority of Scripture. Liberty is easily one of the best schools to "just learn some Bible." Still, Liberty is culturally conscious, having impressive philosophy and apologetics programs. Liberty's online and distance education program is impressive in scope and consistently ranks high among the Best Online Colleges. With its size and variety of options, Liberty offers degrees in all five of the "most marketable degrees" according to MSN News: nursing; information/computer technology; engineering; economics; and education. Liberty is a great school to attend for Bible majors, and "undecided" prospective students, since Liberty has far more degree tracks to offer than most. Liberty has options, but without sacrificing its 24:1 student-professor ratio, or its cost of (roughly) $33,100 per year. Liberty has earned the reputation, under its founder Jerry Falwell, of being a major player within the politically powerful "Moral Majority." Conservatives, Southern Baptists, and Christian educators for decades have called upon Liberty for direction. Liberty will strike some prospects as too partisan and denominational. But the school's size and range of faculty enable some diversity of views, along with other hard-to-find options like degrees in law, cinema, and aeronautics. If the size of this school is overwhelming, students can utilize the distance and online programs. As such, Liberty is one of the most flexible and accessible options for Bible students. Houston Baptist University ranks #4 on The 25 Best Schools for Studying the Bible! To fill out this goal, HBU had a major hiring surge in 2012, taking on acclaimed Christian scholars John Mark Reynolds, Michael Licona, Nancy Pearcey, Bruce Gordon, Richard Martinez, Louis Markos, Mary Joe Sharp, and Holly Ordway. Also added is the Department of Apologetics, to work in tandem with the Philosophy Department. John Mark Reynolds has since left to pursue other interests, but his mark has been made. The ambitious 10 Pillars program, the brainchild of its president Robert Sloan, focuses on a holistically Christian approach. For example, HBU's Honors College is designed on a Classics model similar to the Torrey Institute at Biola (no surprise there, since John Mark Reynolds formerly headed the Torrey program). And the school's plethora of ministry clubs are a wishbook of options for incoming Christian students. The departments are organized in a university liberal arts format, rather than a Bible college format, having a Department of Theology rather than a separate Bible Department. In the Theology Department are four options for Bible-oriented majors (undergraduate and graduate): Biblical Languages (BA); Christianity (BA); Master of Arts in Biblical Languages (MABL); and Master of Arts in Theological Studies (MATS). However, time will tell whether HBU lives up to the ambitious goals of its president. In the meantime, HBU costs about $45,000 a year (overall), and enrolls 2,200—mid-sized, compared to other entries on this list. Grove City College ranks #5 on The 25 Best Schools for Studying the Bible! Independence is a burden and a privilege for colleges. Grove City College (GCC) has shouldered that burden and exercised its privilege to great effect. GCC is rare for refusing federal funding, a move which keeps GCC in the throes of the free market, but allows it a high level of academic freedom. With its Presbyterian background and acclaimed school of Austrian (free-market) economics, GCC has a rich but affordable tradition dating back to 1897. GCC is a true "Bible college," offering only undergraduate degrees. This status allows it to specialize in bachelor's degrees, without dividing its energies and interests into associate's or master's programs. The degrees offered are prestigious. Widely regarded for its humanities degrees in economics, law, politics, and culture, GCC retains and frames those strengths inside an authentic Christian environment. Being a "confessional school," the professors sign a broadly evangelical doctrinal statements though students are not required to do so. Students are, however, required to attend 16 chapels per semester. Students also must complete a three-year humanities program taught from a biblical-Christian worldview, including such core competencies as "Biblical Revelation." GCC is award-winning too, earning high honors from Readers Digest, International Studies Institute, Forbes, U.S. News & World Report, and many others. GCC faculty work within a number of national and international conservative think tanks. This school not only teaches conservative principles, it shapes international conservative policy. Because of GCC's financial independence, it consistently receives "best value" awards, giving an excellent education for half the cost of competing schools. As of September 2017, its per-year cost is about $28,504 total (not just tuition!). The school is medium in size at about 2,500 students, so incoming students should not feel swamped. Besides its strengths in the humanities, GCC also has a reputation for rigorous computer science and electrical engineering departments. Overall, GCC offers an impressive biblical education, specializing in economics, politics, and culture. However, it is not in the highest tier of Bible colleges, since the school's strengths are not in the Bible per se, but rather in a biblically consistent humanities program. #10 among The 50 Best Undergraduate Colleges in the U.S.
#2 among The 20 Best Conservative Colleges in the U.S.
Cedarville University ranks #6 on The 25 Best Schools for Studying the Bible! Tucked away in Cedarville, Ohio, lies a thriving Christian school over 100 years young, Cedarville University (CU). This reformed Baptist school has theological roots in Presbyterianism and the Regular Baptists. Degree options cover the spectrum of humanities and science degrees, a wider spectrum than most schools on this list. There are over 100 accredited degree programs in all. The variety of programs is only rivaled by their depth of study. But what vaults this school onto this list is its mandatory Bible component. All undergraduates have to complete a 16-hour Bible minor, or go further towards a Bible or theology major. This feature not only declares CU's commitment to Scripture, it also shapes the campus culture. Having a mandatory Bible component tends to attract students interested in Scripture and to "scare off" students with an aversion to it. Accordingly, Cedarville has earned a reputation for espousing strong Christian conservative values. Besides the Bible component, Cedarville has mandatory daily chapels, a strong ethics code, and ministry-intensive campus life. Cedarville is a medium-to-large sized school, enrolling 3,760, with 60 of these being graduate students. The cost is about $40,290 a year. The school may strike some as "fundamentalist," but is a far cry from, say, Bob Jones University. Also, there is no apologetics or philosophy program to speak of. There is a Center for Bioethics, as well as a spate of degree options like pharmacology, social work, engineering, art design, and theater. But most of all, students who go here should expect intentional biblical worldview integration within a Bible-intensive course load. Cedarville University ranks #21 on The Best Colleges for Homeschool Graduates. Trinity International University ranks #7 on The 25 Best Schools for Studying the Bible! One of two Illinois schools to make the list is Trinity International University (TIU), in Deerfield. This campus is an all-in-one institution with a renowned undergraduate program, graduate program, adjoining law school, and a divinity school (seminary), offering most every major research degree option along with a host of professional degrees as well. TIU boasts four full campuses and eight extensional sites, ranging as far as California, Pennsylvania, Florida, and into Ohio---not to mention an online program for any potential students out of range from one of the extensions. TIU traces its roots back to 1897, but came into its own in 1940 with the merger of two other schools into it under the new name, Trinity International University. TIU continues that Evangelical Free church tradition today. TIU is a medium-sized school, with about 100 faculty and 2,114 students. Biblical Studies students can expect a 72-hour course load, not counting core classes. And these can overlap with apologetics or bioethics courses, as needed. The cost is about $40,290 total per year, reasonably expensive compared to other schools on this list. The student body and professorate are intentionally diverse, allowing for an international flavor, and a heightened sense of "global missions." The school sports an impressive Bible and theology faculty, including D.A. Carson, John Feinberg, and Kevin Vanhoozer. Moreover, the school has such recognized alumni as Dr. Ravi Zacharias and Willowcreek pastor Bill Hybels. Some students will find the political leanings of the school to be too liberal, with notable tones of "social justice" and "globalism." Still, the school represents a balancing contrast to the likes of Grove City College. Trinity International University also ranks among The Top 20 Online Christian Colleges. Multnomah University ranks #8 on The 25 Best Schools for Studying the Bible! Formerly Multnomah Bible College, this West Coast school founded in 1936 added a graduate school of ministry in 1986 and officially changed the name to Multnomah University in 2008. Broadly evangelical and non-denominational, Multnomah has a fortified history of teaching biblical inerrancy and inspiration and a hard-earned reputation of training students to apply scripture in ministry and vocational service. Today, Multnomah is still largely a Bible College but with additional offerings in science, business, pre-med and pre-law. Their graduate offerings include degrees in teaching, counseling, and ministry. Multnomah has planted extension campuses in Reno, NV and Seattle, WA. Nevada has bridged into online education too. The school has also established the International Renewal Ministries (IRM), a catalyst for racial reconciliation in the Portland area. Besides IRM, Multnomah has launched other, now-independent, ministries including Christian Supply, Mission Portland, and Multnomah Press (now Waterbrook-Multnomah Publishing group). With such a wide presence, one might be surprised to find the school is a modest 25 acres, enrolling only 407 students. The school has kept their focus on biblical studies over the years. Their doctrinal and mission statement reflect the founder's high view of Scripture and a central focus on biblical teaching and training. All undergraduate students are required to take the equivalent of a minor in Bible (15 credits of Bible, 8 theology, and 1 credit in spiritual formation). Multnomah features regional (NWCCU), and ATS accreditation. And they offer rolling enrollment, a benefit for homeschool and non-traditional students. As for the cost, Multnomah froze their tuition rates in 2015 and have been able, since then, to keep their total cost per year (undergraduate) at a reasonable $33,240. Wheaton College ranks #9 on The 25 Best Schools for Studying the Bible! Just outside of Chicago Illinois is Wheaton College. Founded in 1860, Wheaton is a long-standing, medium-sized (2,400 enrolled), non-denominational, Protestant evangelical school highly regarded in the region and widely praised in Christian circles. Their strong Christian heritage and lasting Christian witness is doubly impressive considering the school is perhaps the most prestigious Christian college in the country. Wheaton has all the proper accreditations and has earned a wide range of awards including competitive ranking in Forbes and U.S. News & World Report. The school costs about $44,000 a year and is known for its world missions, its music department, and its psychology and counseling. While the school is solid in Bible, there are other schools, ranked above, that are considered a superior Bible education. Wheaton's singular strength is their missions emphasis, seen in their Center of Evangelism, Billy Graham Museum, and their practical involvement in student missions efforts around the world. This missions emphasis lends practical application to their Bible training. Moreover, Wheaton is unique in offering degrees in Bible at the bachelor's, master's, and doctoral level (BA, MA, and PhD). Technically they are a "university" and not a college, but apparently the name "Wheaton College" stuck. These graduate and undergraduate degree offerings are situated within a broad liberal arts curriculum, and a variety of available study tracks. Wheaton has also introduced, recently, several classes in apologetics which can add a fresh and interesting depth to Bible study. Aspiring students who lean conservative should be aware, however, that Wheaton has a reputation for social and political liberalism in their humanities departments, and theistic evolution in their science department. But for many students, these are non-issues. #25 among The 50 Best Undergraduate Colleges in the U.S.
Dallas Baptist University ranks #10 on The 25 Best Schools for Studying the Bible! Providing genuinely “Christ-centered” education, Dallas Baptist University (DBU) is a worthy entry on this list. Founded in 1898 as Decatur Baptist College, she was relocated to Dallas in 1965, and 20 years later took on the name Dallas Baptist University. Now affiliated with the Baptist General Convention of Texas, and possessing SACS accreditation (and relevant accreditations for its business and music schools), DBU enrolls more than 5,156 (undergraduate and graduate), in 92 different degree programs, covering a wide range of Christian studies, and sporting an array of on-campus Christian organizations---all within a thriving Christian community in the Dallas-Fort Worth Metroplex. Despite its fairly large enrollment, the campus is cozy and simple, elegantly situated overlooking Mountain Creek Lake. It feels homey and clean. Classes average a 15:1 student-to-professor ratio. The yearly cost of attendance is between $36,000-$41,000. Besides its wide array of degree offerings, DBU's unique contribution is its combination of leadership training and philosophy. Students can major in Biblical Studies and complement that with a second major in philosophy then continue on to a master's in Christian Education or Global Leadership. Of course, DBU also offers state-certifying degrees in nursing and education (K--12), or other vocational fields like finance, marketing, music, broadcasting, criminal justice, etc. Anchoring its biblical principles, DBU requires all students to take classes in Old Testament, New Testament, “The Christian Mind,” and two electives in religion. This core amounts to 15 hours, enough for a minor in most schools. Students can further complement their academic biblical training through participation in the Honors program, or students missions, or involvement in the various events in the School of Leadership. Toccoa Falls College ranks #11 on The 25 Best Schools for Studying the Bible! In the foothills of the blue ridge mountains, just outside of the Chattahoochee National Forest is the picturesque campus of Toccoa Falls College (TFC). Named after the on-campus 185 foot waterfall of the same name, Toccoa Falls is a certified treasure. Originally founded by R.A. Forrest in Golden Valley, North Carolina in 1907 with the Christian Missionary Alliance (Denomination). The school eventually relocated to a more strategic setting in Toccoa Falls Georgia and promptly changed the name. They offered their first 4-year bachelor's degrees starting in 1937. Today TFC is comprised of 4 schools: Ministry, Nursing, Art and Science, and Professional Studies. In the ministry department alone, students can choose from 13 ministry degrees tracks. Overall, students can choose from 35 majors and 43 minors. The unifying mission of the school is "teach and defend the historic and basic doctrines of evangelical Christianity." TFC is unapologetically Christian in their stated vision and values. And while the school affiliates with the Christian Missionary Alliance, they are non-sectarian and broadly evangelical embracing a range of denominational backgrounds among their students and faculty. TFC enrolls 1,200 students, 650 of which are traditional undergrads, and the rest are online and non-traditional student. Class size is a modest 13:1 student to teacher ratio. Toccoa Falls is also well-regarded among homeschoolers, with homeschool students comprising 10% of their enrollment. Pay-rents may like to know that all students receive scholarship funding, and the total cost for resident students per year (in 2017) is $31,689. It's no wonder Toccoa Falls has become a hidden gem in the southeast region with accolades from Princeton Review, U.S. News and World Report, and Colleges of Distinction. University of Dallas ranks #12 on The 25 Best Schools for Studying the Bible! The only Catholic school to make the list is just down the road from DBU---it is the University of Dallas (UD). This school approaches the Bible through the framework of its Catholic distinctiveness. Located 10 miles outside of Dallas, this school has a heritage in both Franciscan and Dominican monasticism—thus merging the ecumenical and the scholastic strengths of both. It offers 12 strictly biblical courses (such as "Module 4: Mark and Luke"), at two credit hours each, spread across a four-year schedule. The format is conducive to undergraduate, graduate, and adult education. However, there is no basic BA degree in Bible. The Bible degrees work in supplement with other named degrees such as a BA in Pastoral Ministry, or Biblical Languages. While the Bible school is strong, what has really earned a reputation for UD is their Great Books curriculum. This use of the great texts of Western Civilization explores, critiques, and celebrates the benefits of the Western cultural tradition while at the same time fostering it. DU's Great Books curriculum does not stop with old books, but leads into modern works, as well. Most undergraduate students are confessing Catholics (82%). But the school's appeal reaches beyond Catholic circles with its strong Christian emphasis. Students are not required to sign any Catholic confessional statement. UD also has one of the strongest study abroad programs in the nation, with 80% of students studying in partner universities overseas, primarily in Rome, Italy. UD is also noted for its art department and its doctoral concentration in politics. UD enrolls 1,407 undergraduate students and about 950 in their graduate program. It consistently ranks among the top-100 lists of national universities (or higher) compiled by Forbes, U.S. News & World Report, and Princeton Review. Evangelical Protestants may have a hard time finding their Protestant distinctiveness nurtured on campus, but they are still in the Bible belt with plenty of good churches and a supportive off-campus culture. And they may find more familial support among Catholic peers than in theologically liberal "Christian" school like Texas Christian University or Furman. Nevertheless, the lack of on-campus Protestant activities is a detriment, as is the cost, about $54,976 per year. The degree options are also limited. Students can get a biblical languages degree, a continuing education certificate in Bible, or can have concentrations in Bible within other degree tracks like pastoral ministry. There is no "Bachelor of Arts in Biblical Studies" or anything comparable. Still, UD's elite philosophy department and its Great Books curriculum establish it as a top-tier liberal arts school, and its 24-credit Bible program makes it a great option for adults and non-traditional students who are friendly to Catholicism. Ranks among The 50 Best Undergraduate Colleges in the U.S.
Gordon College ranks #13 on The 25 Best Schools for Studying the Bible! Birthed out of a Boston church basement in 1889, Gordon College has grown into one of the premiere Christian universities in the nation. One of the most distinguished colleges on the list, Gordon has commendations from Forbes, Princeton Review, and U.S. News and World Report. Founded by evangelist and pastor A.J. Gordon as a missionary training center, Gordon College's motto is, “Freedom within a framework of faith.” Besides her 36 academic departments, including Biblical Studies, Christian Ministries, and Philosophy, Gordon College features institutes and centers for “Faith and Inquiry,” “Christians in the Visual Arts,” “Nonprofit Studies and Philanthropy,” and the “Christian Vocational Institute.” Gordon's seminary now operates independently, having merged with another school to make Gordon-Conwell Theological Seminary. There are many distinguished Christian colleges that did not make this list, but what includes Gordon College here is its required confessional statement signed by all students and faculty, a conservative Christian statement of faith, its affiliation with Gordon-Conwell Seminary, its substantial Biblical Studies Major, its twice-weekly chapel services, and its wide range of ministry opportunities on-campus and off. Common courses to all majors include Old and New Testament, Christian Theology, and Gordon distinctives “The Great Conversation,” and “The Examined Life,” as well as unspecified required electives in Civic Responsibility, Global Understanding, and the Human Person. Students can find all the amenities suitable to this medium-sized liberal arts university: 38 undergraduate majors, three graduate degree options (including education and music), 2004 students enrolled, and a 13-to-1 student-faculty ratio. Gordon has study abroad partnerships in France, Italy, Austria, and Romania. This kind of education does not come cheap: at almost $47,740 a year, Gordon is among the most expensive on this list. But students here will get a quality education in a confessional Christian environment, with some academic distinction to boot. Oral Roberts University ranks #14 on The 25 Best Schools for Studying the Bible! The most charismatic entry on the list is Oral Roberts University. Founded in 1963 in Tulsa, Oklahoma, by Pentacostal word-faith evangelist Oral Roberts, this institution has a checkered history from its founder and subsequent presidents. However, since its new presidency under Mark Rutland in 2009, ORU reached debt-free status and has earned high marks as the largest and one of the most respected charismatic universities in the world. ORU is unabashedly ministry-minded, aimed at life-application more than biblical abstraction---the school seeks to live out the Bible. But this ministry is not without recognition. ORU is acclaimed as a Steinway School (as of 2011), a “Best in the West” regional school in the Princeton Review (2011-2012), a U.S. News “Top Tier” school, and even a top “Military Friendly School” according to Victory Media (2013). These commendations fit ORU well. Among its features, the school competes in eight NCAA Division 1 sports. Class size runs about 15 students per professor with about 3,852 enrolled (including 562 are graduate students). Students can major or minor in any of 15 Theology and Ministry degrees. All told, there are 6 colleges (departments), a whopping 60 majors, 13 graduate programs, two doctoral programs, and a bevy of minors to choose from. ORU retains a distinctly Christian curriculum, with core classes including Old Testament Survey, New Testament Survey, Christian Worldview and Culture, and some ORU distinctives, “Whole-Person Assessment” (a character-formation portfolio) and “Spirit-Empowered Living” (charismatic Christian living). Students can have all of that for around $35,542 a year. Taylor University ranks #15 on The 25 Best Schools for Studying the Bible! About halfway between Fort Wayne and Indianapolis, Indiana is Taylor University. This NAIA Christian liberal arts school is ranked the #1 Midwest regional college by U.S. News & World Report (in 2017). They've held this spot for ten years in a row. Taylor has also received awards from Forbes, Princeton Review, and Christian Colleges of Distinction. A non-denominational school, Taylor was originally a methodist women's college in the mid-1800's. The school has long since expanded to include men and women and follows to broadly non-denominational evangelical theology. While many colleges drift from their religious roots, Taylor has managed to stay anchored with required confessional statements from all staff, a "covenant together" (code of conduct) statement for students, and an overarching ministry-minded mission statement: “The mission of Taylor University is to develop servant leaders marked with a passion to minister Christ's redemptive love and truth to a world in need.” Reading these statements, Taylor seems keenly aware of the penchant for legalism. Taylor has that delicate balance of Christian culture without the trappings of hyper-fundamentalism. As of 2017, Taylor's enrollment is 1,890 with 460 students having served in international study and service programs. The school offers 119 different study tracks, with 6 different Bible and ministry study tracks, and 110 classes available entirely online. The graduate program is a modest 39 students, with two master's degree options: Teaching and Business. The average class size at Taylor is a small 13:1 ratio. Like all the schools on the top 25 list, Taylor University features all the right accreditations regionally, nationally, and by program. The current cost is an upper level rate of $42,130 per year. University of Northwestern St. Paul ranks #16 on The 25 Best Schools for Studying the Bible! The University of Northwestern of St. Paul, MN is a 3,000+ student liberal arts college of some renown in its region. Not to be confused with the similarly named schools in Illinois or Iowa, this college has a long-standing history as a Bible training center in the great lakes region of Minnesota. Originally a Bible and Missionary training school, UNW was founded in Minneapolis in 1902. UNW maintains a biblical Christian culture on campus through daily chapels, an active campus ministry presence, and their “Declaration of Christian Community,” a signed statement of conduct for faculty, staff, and students. UNW is well-priced at about $30,260 for undergraduates. And if you were to utilize their graduate offerings at the Divinity School, it'd be $490 per credit hour. The Divinity School offers additional faculty support for advanced and senior level courses, bolstering the intellectual heft of the Bible program. Class size is fair, at 14:1 student to teacher ratio, and about 22 students per class. Northwestern College ranks #17 on The 25 Best Schools for Studying the Bible! One of only two Iowa schools on the list is Northwestern College (not to be confused with several similarly named schools in other states). Located in Orange City, Northwestern College (NC) has been an educational gem for over 100 years. Commended by Forbes, U.S. News & World Report, Washington Monthly, and Princeton Review, the word is out about NC. Such commendation often accompanies theological compromise, but NC stays true to its Reformed theological roots by maintaining weekly chapel services, an enduring statement of faith, and a visionary commitment to biblical authority, Reformation theology, and creedal Christian ecumenism (multi-denominational unity). Also a plus is the weekly student-led Sunday night praise and worship service. NC enrolls about 1,260 students, sports a 14:1 student-to-faculty ratio, and offers over 40 majors. Keeping this school fairly low on this list is its lack of integration between education and ministry. Students can major in Christian Education and Youth Ministry, or Religion, but those are the only two distinctly religious options for ministry-minded majors. There is also a minor in Christian missions, but these degree restrictions keep this Iowa school from rising above the status of “Education in a Christian setting,” as opposed to a thoroughly integrated “Christian education.” Also, the general studies requirements only comprise eight hours (two classes) of “Biblical and Theological Studies”---roughly half the course load of a minor. The cost? $39,500 per year. The Master's University ranks #18 on The 25 Best Schools for Studying the Bible! A few miles north of Biola, under the impressive auspices of Pastor and Doctor John Macarthur, lies the Santa Clarita, California, school: The Master's University (MU). The 1,200-strong student enrollment places this school in the "medium-to-small" range. As a liberal arts school, MU offers an array of baccalaureate and graduate degrees in the usual fields, like nursing, education, computer science, and business, as well as such Bible-intensive degrees tracks as general Bible studies, Bible exposition, biblical counseling, biblical languages, Christian education, intercultural studies, theology, and apologetics. MU is also home to a small graduate school/seminary, should ministry-minded students want to crown their BA in Bible with an MDiv or an MA. The Master's University is clearly a Bible-focused, ministry prep school. Students can expect an a total cost of about $38,175 per year, not counting fees. Their online options likewise enable today's student to keep up with college. And with the gravitas of Macarthur presiding over this school, the Master's University shows great promise for future students who might be entering the ministry. The Masters University would be ranked higher on this list except they have only regional and ACSI accreditation. They are not yet accredited with any of the preferred accreditation boards mentioned above (ABHE, TRACS, or CCCU). Hardin-Simmons ranks #19 on The 25 Best Schools for Studying the Bible! In the small town of Abilene, near the middle of the state of Texas is Hardin-Simmons University, a private, liberal arts school affiliated with the Baptist General Convention. Founded in 1891 by pastors, ranchers, and merchants, this West Texas school underwent several name changes in it's history but all the way through they have been steadfast in offering quality Christian higher education in the southwest. The school's motto is simple: "Education enlightened by faith." Hardin-Simmons has grown beyond just a "ministry" school and has become a substantial liberal arts school in it's own right, spanning seven academic departments, most notably their nursing and educational studies schools. Their study abroad program is another plus, covering locations in Australia, the United Kingdom, Spain, and other regions. As of 2016 the school has enrolled 2205 students (1708 undergrad; 497 grad). The biblical-Christian foundation at Hardin-Simmons shows in their weekly chapel services and vibrant campus ministry life, together with their undergraduate Bible offerings consisting of 6 programs through Logsdon school of theology, where students can choose between biblical studies, religion, ministry, biblical languages, religion-minor, and ethics. Meanwhile graduates students can earn a master's in family ministry, divinity, religion; or a doctorate of ministry. Hardin-Simmons also boasts an impressive 12:1 student to faculty ratio and NCAA-III status in sports, with a bevy of athletic achievements to boot. The price at Hardin-Simmons is modest at $36,216 but two big factors counterbalance the cost. 98% of students receive financial aid. Plus, the tuition rate "locks in" freshman year; so that rate remains stable for returning students. It's no wonder Hardin-Simmons has garnered multiple awards from the likes of Princeton Review, U.S. News & World Report, and Colleges of Distinction. Bethel University ranks #20 on The 25 Best Schools for Studying the Bible! Unlike most schools on this list, Bethel never started as a Bible college or even as a college. Bethel was originally a seminary, Baptist Union Theological Seminary to be exact. The name has changed since then, to Bethel University, as the school has grown to be one of the largest and most esteemed Christian universities in the country. Yet they maintain their ideological roots affiliating with Converge Worldwide (the Baptist General Convention) and staying true to the Bethel founder, John Edgren, "to develop broadly educated, critically thinking Christians-changing the world through service and leadership in Christ's name." Now Bethel University has broadened their educational offerings across four schools: arts & science, adult and professional studies, Bethel Graduate school, and Bethel Seminary. To these can be added Bethel's online offerings and their BUILD program (for students with learning differences and developmental disorders). All undergraduate students partake in the general studies core featuring 9 credit hours of Bible, 18 credit hours in "Global Perspectives" (culture, religious studies, and missions), and a capstone senior research project on a contemporary Christian issue (of the student's choosing). Besides these core offerings, undergraduates have at least 11 different Bible and ministry degree tracks to choose from. And non-traditional, graduate and seminary students have at least 11 more advanced study tracks in Bible and ministry. Bethel is one of the largest schools on the list enrolling over 6,000 students across their 100 plus degree options. And with their substantial online course offerings and their two campuses in St. Paul, MN and San Diego, CA, the school is poised to grow even larger. At that size, the school has the liberty to keep their costs high: $46,255 total per year (for undergrads). Fortunately, 90% of students receive financial aid. Bethel University ranks #23 on The Best Colleges for Homeschool Graduates. Messiah College ranks #21 on The 25 Best Schools for Studying the Bible! Messiah college features 11 different Bible and ministry study programs (including majors, minors, and concentrations). These study tracks combine well with an extensive study-abroad program. 84% of all students study or serve abroad, but students can also put their bible training into action locally too. Located 12 miles outside the state capital, Messiah is in a prime location for service learning and ministry opportunities. Prospective students may also take advantage of the different study tracks including dual-credit classes (for high school and college credit), online classes, and a 3-year intensive degree plan. Messiah is also a NCAA-III school with 12 different sports and 23 different championship titles over their history. As for costs, the school is fairly expensive at $44,380 total cost per year (in 2017). But fortunately, the school excels in financial aid opportunities. All students receive financial aid, with the average aid package being $24,546 per student. Johnson University ranks #22 on The 25 Best Schools for Studying the Bible! Johnson University was founded in the foothills of the Great Smoky Mountains in Knoxville, Tennessee in 1893 for the purpose of training upcoming ministers for the mission field. A broadly evangelical non-denominational institution, their original name was "School of the Evangelists." Later, the school changed their name as their course offerings expanded into vocational and ministry fields beyond evangelism, becoming "Johnson Bible College" and later, "Johnson University," commemorating the school's founder, Ashley B. Johnson. Today, Johnson University is a solid small-to-mid-sized Christian liberal arts school with 1,026 students across their undergraduate, graduate, and doctoral programs, across all campuses. Johnson has two brick-and-mortar campuses, the main campus in Knoxville, TN and another campus in Kissimmee, FL added in 2011. Johnson's online campus is about 120 strong too. On top of their full and online campuses, Johnson University features five ExtendEd programs (extension campuses) for adult and alternative education in Indianapolis, IN, Knoxville, TN, Louisville, KY, Phoenix, AZ, and Orlando, FL. The school maintains their christian identity with a non-sectarian statement of faith, regular chapel services, and an established reputation as a ministry training center. Uniting all their educational efforts is a ministry focus combining a three-fold course of study: (1) arts and science, (2) Bible and theology, and (3) professional studies. Students can choose from over 70 degree programs and enjoy the small class size of 14 students per teacher. Combine all these strengths with the bargain basement cost of $21,880 (total cost per year) and it's clear why this school is a compelling option for Bible students. Emmaus Bible College ranks #23 on The 25 Best Schools for Studying the Bible! Nestled in the Mississippi river town of Dubuque, Iowa is Emmaus Bible College. Emmaus is a small Plymouth Brethren school with about 250 resident students (as of 2012), not counting online and distance learning students. Founded in 1941 to train students in "living out the principles of New Testament Christianity," this school requires all students to complete reading the entire Bible by the end of Freshman year. Additionally, the core curriculum includes a Bible major. That means every student is at least a Bible major together with any other major they choose. But at Emmaus, Bible study is not enough, by itself, to complete one's Biblical training. Students are also required to complete 30 hours of community service per semester within their Servant Leadership Training, and serve 3 hours per week on campus through the Student Work Assistance Program (SWAP). Students can be exempted from SWAP with a $400 buyout. These service learning requirements help keep tuition costs down and helps students personally invest in their school and local community. Emmaus also features daily chapel and small groups and has a code of conduct which prospective students take note of before signing up. The school is non-denominational but with a strong leaning towards their Plymouth Brethren heritage, which effectively shapes the campus culture. Emmaus is fairly comprehensive in their efforts to train the whole person spiritually and socially, and students should be aware of what that involves. Emmaus features rolling admission, so students can apply at any time. The cost of attendance, as of 2017, is a very reasonable $25,620 (on average) for resident students. In that regard, Emmaus was ranked the #1 Best Value college in Iowa in 2016 according to BestValueSchools. Asbury University ranks #24 on The 25 Best Schools for Studying the Bible! Originally founded in 1890 by John Wesley Hughes, this Wilmore, Kentucky college is rooted in the Wesleyan Holiness tradition. Yet, despite their Wesleyan and Methodist heritage, Asbury identifies as a broadly evangelical school, friendly to a range of Christian denominations and maintaining independence from denominational constraints and even from government influence. Asbury receives no government funding. Practically, this independence means a few things. For one thing, they have to keep their school offerings competitively priced since there's no government funding offsetting things. But also, they are reasonably independent of government and denominational ties that may pressure the school to conform to cultural trends and modern fashions. For Asbury, that means they can stay true to their founding principles. Originally the school was named "Kentucky Holiness College," but later took on the name of "Asbury" in honor of the famous circuit-riding methodist preacher Francis Asbury. To this day, the school retains a strong emphasis on practical ministry and evangelism just like it's founder John Wesley Hughs. Asbury enrolls 1,838 across 14 different academic departments, and 54 different majors. Students have 7 different Bible and Ministry options for their major and minor. They can also pursue graduate work in education, communication, business administration, or social work. The school maintains their Biblical Christian identity through regular chapel services, daily Bible study, and a character-based campus-wide initiative called the "Cornerstone project." This program fosters staff and student development in four key areas: scripture, holiness, stewardship, and mission. Asbury is not the best bargain on the list, but neither is it the most expensive. The average yearly cost per student is $39,389. Clarks Summit University ranks #25 on The 25 Best Schools for Studying the Bible! Clarks Summit University, formerly Baptist Bible College and Seminary is an Independent Baptist College enrolling just under 1,000 students, roughly a third of them graduate students. Once the school was Baptist Bible College of Johnson City, New York, in 1932. The school grew and relocated in 1968 to her current location, opening a seminary in 1972 and a graduate school in 1989. In 2015 the school adopted the name, Clarks Summit University, about the same time the location name changed to South Abingdon Township. The denominational affiliation is Independent Baptist and may strike some students as “fundamentalist,” but the school has earned a modest reputation for Biblical conservatism and genuine Christian scholarship. Clarks Summit is fully accredited and offers 44 resident degree tracks and five online. Bible-related majors include: Chaplaincy, General Missions, Intercultural Youth Ministries, Nursing Missions, Pastoral, Outreach Pastor, Worship Pastor, Sports Ministry, Camping Ministries, Women's Ministry, Pre-seminary, Counseling, and many others. General studies courses, required of all students, include Old Testament, New Testament, Bible Study, Biblical Lifestyle, Bible Exposition, four theology courses, and a Bible-related Senior Seminar. The total cost for undergraduate students is an affordable $29,320 a year. There are many other commendable schools worth your consideration. Ultimately, the best school for you is the one that's right for you. And there's no perfect system for evaluating which one will suit you best. So the following honorable mentions--listed in alphabetic order--deserve attention as each of them is a regionally and nationally accredited institution of higher learning with significant Bible programs, including programs in Religion and Theology and Biblical Language. Each school is listed below with their city and state along with their denomination leaning or nearest equivalent. Be aware, that most schools accept students from a wide range of church/denominational backgrounds. And many of these schools have only loose or no denominational affiliations regardless of what the brochures say. This list includes Bible schools as well as other schools with strong Bible programs. All the Bible schools on this list are also Christian schools, but not all Christian schools here are Bible schools. These two overlap a lot, but there are some important differences between them. "Bible schools" are essentially specialty training schools in Bible. Meanwhile, liberal arts Christian schools like Biola, Liberty, or Regent, devote considerable time and energy towards a well-rounded education including science, math, history, literature, art, and so on. Christian schools can have great programs in Bible, but they just aren't as narrowly focused on Bible like Bible schools are. Students can graduate from liberal arts schools with a degree outside of Bible or ministry, perhaps taking only one or two core classes in Bible. Liberal arts schools also tend to incorporate a lot of non-biblical influences from philosophy, science, literature, and culture studies. In some ways this variety can explore biblical implications and applications and can even enlighten one's reading of the biblical text. Bible schools, on the other hand, focus their curriculum on studying and understanding the Bible itself. These schools are not, generally, liberal arts schools (with the exception of Cedarville University), they are specialty schools. So they lack a measure of breadth but they make up for it in depth, with more Bible classes, more Bible-centered study, and more institutional focus on the Bible. Students at these schools are required to take core Bible classes, even if they pick the most peripheral "non-biblical" major. Bible schools also tend to identify with a denomination or particular theological tradition. The result is that Bible colleges reserve the time and focus to dive deep and explore their particular school of thought. Bible schools, like Moody, Baptist Bible College, and Emmaus, identify most or all of their degree programs within some field of Bible, missions, or ministry training. Collectively, Christian schools and Bible schools serve a vital role in faith and learning in America, and many Christian colleges are expanding their reach with online degree programs. Historically, many Christian schools grew out of the spiritual morass left behind when traditionally Christian colleges---like Harvard, Princeton, Yale, and William and Mary---veered a secular direction away from their Christian roots. And the Bible school movement specifically can be traced back largely to Dwight L. Moody and Moody Bible Institute. Christian and Bible schools gradually grew in the late 19th and early 20th Century. Today we find Christian and Bible schools steadily emerging as a counter-cultural trend empowering Bible-focused training in higher education.